Find and compare the best prices from a range of well known car rental companies at Amsterdam Airport. This is a free to use facility, enabeling you to book direct with the company quoting the price. 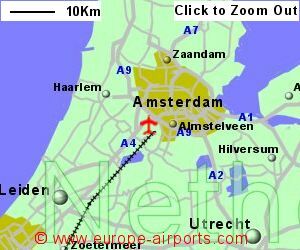 Amsterdam Airport, otherwise known as Schiphol Airport, is located 15Km South West of Amsterdam, the Netherlands capital city, in the north Holland region of the country. 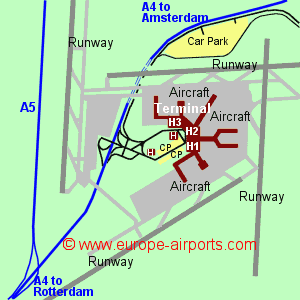 Schiphol airport has one large terminal, divided into three halls (1,2 and 3). A temporary new extra departure accessed from Hall 1 was opened in spring 2017, designed to be in use until the end of 2019. Schiphol train station is underneath the airport terminal where it is a 15 minute journey into Amsterdam. Fast internation trains are also available with journey times of 1hr 37 mins to Brussels, 2hrs 15 mins to Dusseldorf, and 4 hrs to Frankfurt. A number of bus services and taxis are also available. Short term parking is located within 300m of the terminal building while long term parking is approximately 3Km away. Shuttle buses make the 10 minute journey from the long stay car park to the terminal every 10 minutes. Schiphol airport has a large range of bars/restaurants, shops, banking and FREE WiFi Internet access (Free for 4 hrs but can then reconnect - also a higher speed paid for option). Sheraton, Hilton, and CitizenM hotels are located within the airport site, the former two having covered access to the terminal building. Plus the Yote and Mercure are located within the terminal building. 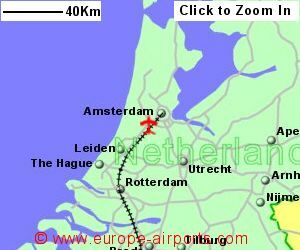 Amsterdam airport has Airport Carbon Accreditation, at the Neutrality level. 68.5 million passengers passed through Schiphol airport in 2017, an 8% increase on the previous year, and the airport's busiest year yet. Schiphol is Europe's 3rd busiest airport, after London Heathrow and Paris Charles de Gaulle.